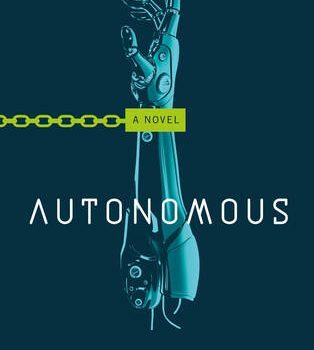 Autonomous, Annalee Newitz (Tor 978-0-7653-9207-7, $25.99, 306pp, hc) September 2017. With only a handful of stories published – sometimes in think-tankish venues such as Hieroglyph or Bruce Sterling’s Twelve Tomorrows – and with a distinguished career in science and SF non-fiction and journalism, Annalee Newitz might well be expected to produce the sort of programmatic first novel that we used to get from professional ‘‘futurists’’ like Robert Theobald or even astronomers like Carl Sagan: filled with provocative ideas discussed by characters who don’t move very much. 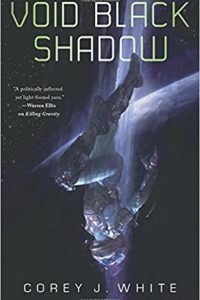 And indeed Autonomous has its share of provocative ideas, focusing mostly on two broad themes, one of comparatively recent vintage and one a longstanding classic SF theme. The more recent one deals with the role of designer drugs, neurology, and the questionable ethics of Big Pharma; the classic theme involves a robot learning to become human. The latter may look new, since it’s long since been recast in terms of artificial intelligence, but the basic question is as old as Eando Binder, Lester del Rey, or C.L. Moore, and as recent as Rachel Swirsky stories and Spielberg movies. What we might not expect, but what Newitz delivers in spades, is how she weaves these disparate ideas into a flat-out pursuit-and-escape thriller plot involving intellectual-property pirates, corporate irresponsibility, economic indenture, gender identity, and international intrigue. The story begins with Judith Chen, who calls herself Jack, brutally killing an intruder on her private submarine in the Arctic Ocean – she needs to keep moving to such unexpected locations since her profession involves reverse-engineering proprietary drugs in order to make them available to those who can’t afford the the drug companies’ extortionate prices. But her latest project has backfired: both the new corporate drug Zacuity and her pirated free version of it are highly addictive performance-enhancing drugs, which, instead of simply making people enjoy their work more, effectively turn victims into workaholic robots, sometimes to the point of death or disaster. The intruder on her sub is a ‘‘fusehead’’ drug thief, but his partner – whom she originally takes to be a robot – is a rather pathetic indentured servant named Threezed (from the indenture number branded on his neck), who becomes her assistant as she sets out, guilt-ridden, to develop some sort of antidote to Zacuity. 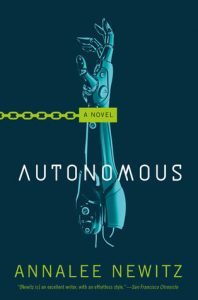 On the one hand, then, Autonomous is driven by a classic straight-line suspense plot: will Jack be able to find the antidote before the IPC agents track her down? 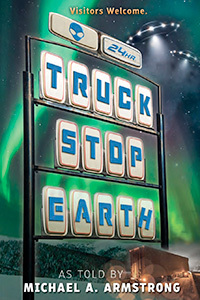 On the other, this is all set in a densely imagined 22nd century that ranges from Iqaluit in the Canadian Arctic, to Vancouver and Yellowknife, to a domed-over Las Vegas and even Casablanca, and each setting provides hints of an intriguing backstory, sometimes hinting at amajor Collapse of some sort in the 21st century that helped give rise to the hypercorporatized world of indentured servitude and emergent AIs. We also meet some of Jack’s allies and learn a bit about the reasons for her pharma-piracy, but for the main part we remain focused on her dual mission to undo the damage she helped cause, while helping Threezed find a free place in the world. By the end, it’s apparent how the two main plot lines echo and reflect each other – there is the drug horror story of victims effectively turned into pharmacological robots, while the actual robot Paladin tries to move beyond its initial programming to learn about the possibilities of free will, of what it means to be autonomous. While Jack Chen makes for an appealing outlaw in a tradition that goes back to classic adventure fiction, Paladin is by far the most interesting character in the book, and while his/her grappling with the notion of being human is far from new in SF, Newitz’s sophisticated understanding of current AI research and of the social construction of gender make a good case for rethinking the fictional uses of bots, and make Autonomous one of the most accomplished debut novels of the year. Robots are metaphors about social control, about how we don’t have autonomy. It is prima facie an error to misread. Real people don’t have autonomy in the sense pretended by “free will,” which is a religious concept. That’s why choosing to give robots souls is choosing sentimentality. As for sophistication in AI research? Look, no AI will be mortal like people, therefore they will never become people. Stupidity like that is why I could never get into Next Generation. As for using “robots” as a set piece about social construction of gender? Maybe. On the other hand, Newitz was the genius who managed to see the white people trash the tower but still manage to see Tarzan in Avatar. Can a person with that lack of judgment ever do anything good? Reminding us of her previous career was a bad call. The review doesn’t make this sound good at all.